By Jordyn Grzelewski | December 5, 2017 at 12:05a.m. 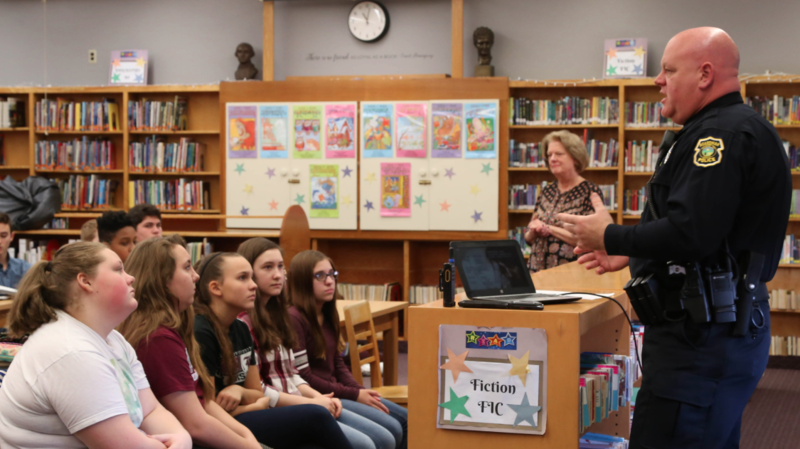 Among several dozen students gathered in Glenwood Junior High School’s library, most knew someone affected by drug addiction. The pervasiveness of the opioid epidemic, illustrated Monday by dozens of hands raised in the air, makes drug education more important than ever, the leaders of a new program at Boardman schools said. To support students dealing with those tough situations, Merlo said he emphasizes to them that there are adults who are there to support them and listen to them. “If you ever get into a pinch, you have adults here who are willing to help you,” he told a group of eighth-grade students Monday. Eighth-graders are learning this week about prescription and over-the-counter drugs as part of the “Too Good For Drugs” program, which launched last year with fifth- and sixth-grade students and this year expanded to seventh and eighth grade. Since early October, eighth-grade students have learned about decision-making, coping skills and empathy; alcohol; tobacco; marijuana; and prescription and over-the-counter drugs. Seventh-grade students will take the lessons later in the school year. Previously, Boardman students took the Drug Abuse Resistance Education program or learned about drug education in health class. The new program is more “intensive,” said Karen Kannal, district parent outreach coordinator. It’s also more coordinated. The program is a collaboration among the schools, police department, Meridian Healthcare, a Mahoning County juvenile court early-warning program and Coalition for a Drug-Free Mahoning County. Merlo, Kannal and Meridian prevention educator Angela Sammartino-Krauss talked to students Monday about why people begin to use drugs, the difference between prescription and over-the-counter drugs, the history of opioids and how they’ve caused a national addiction epidemic, and more. Students also learned how to recognize the signs of addiction, the effects of drug withdrawal and strategies they can use to avoid peer pressure. Students recited the strategies: Make an excuse, walk away, change the subject, come up with a better idea, and others. “These aren’t scare tactics. We’re not trying to intimidate you,” Merlo said. December 4, 2017 10:55 p.m.
October 31, 2017 12:10 a.m.
December 11, 2014 12:05 a.m.
June 29, 2018 12:06 a.m.